The Vegetable Grower's field day, at the Bradford Research Center, will take place on Thursday, Aug. 2 at the Center near Columbia. The event will run from 3-6 p.m. It is free and open to the public. 3-3:30 p.m.: “The importance of pollinator stewardship to home gardeners,” David Trinklein, Associate Professor, Division of Plant Sciences. 3:30-4 p.m.: “Production techniques and systems used by the Columbia Center for Urban Agriculture,” Tony Minnick, CCUA Farm Manager. 4 p.m.: Tour wagons load and visit vegetable research sites. 4:15-4:45 p.m.: “Organic watermelons and cover crops,” Steven Kirk, Research Specialist II, Division of Plant Sciences. 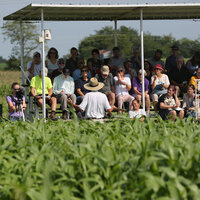 4:45-5:15 p.m.: “Sweet corn,” Tim Reinbott, Assistant Director, MU Agricultural Experiment Station. 5:15-5:45 p.m.: “Hops variety trial,” James Quinn, Associate Extension Professional. *The wagons will leave the conference building at 4 p.m. Individuals interested in the Wagon Tour need to be ready to depart by that time.